A Supply Chain describes a system flow from the raw product to the final product that is delivered to a customer. Hence, the participating organizations, people and transport processes are part of a Supply Chain. The Wood Supply Chain denotes a special Supply Chain that describes the flow of timber. This work focuses on the logistic operations from timber production to the first processing step in a saw or paper mill, and seeks to optimize the Wood Supply Chain with Adaptive Large Neighborhood Search. By introducing spatial amendments to Adaptive Large Neighborhood Search it is capable of solving the spatial-temporal problem of Wood Supply Chain optimization. A comparison of the obtained results and initial results give evidence that the optimization approach with spatial amendments results in an increase of the objective function of the given problem. Spatial optimization is a subfield of geography contributing – among others – e.g. to the field of transportation, location modeling or land use planning (Tong & Murray, 2012). Spatial optimization relies on mathematical optimization techniques to structure and solve problems with an inherent spatial context. Thus, any spatial optimization problem is an optimization problem where the spatial dimension is a crucial part and is part of the optimization problem itself. Such a geographical nature of an optimization problem can be reflected either as spatial variables and coefficients but also in terms of spatial relationships. Examples for such relationships are e.g. distance, adjacency, connectivity, containment, intersection or pattern (Tong & Murray, 2012). The importance of spatial optimization stems from the practical usage and the various application contexts of spatial problems. Due to contemporary available computing power we are able to model and solve complex spatial problems which are regarded computationally intensive. Hence, spatial optimization can help in decision making contexts, by delivering solutions to complex spatial problems. The spatial optimization problem addressed in this paper is summarized in the term Wood Supply Chain. The Wood Supply Chain (WSC) is a special Supply Chain that characterizes the flow of timber starting at the production of the raw material and ends at the customer. To describe the WSC the stakeholders are listed: forest enterprises, saw mills, haulage companies and associated vehicles (see Figure 1) which are connected. In the WSC under investigation there are two distinct processes that have to be considered: transportation and timber trade. Timber trade in the WSC takes place at the saw mill where the delivered timber is measured. This process generates a monetary value in the supply chain which is refunded to the forest enterprise delivering the timber. This value is denoted as turnover in the following paragraphs. Transportation describes the process of timber haulage from forest enterprises – where timber is piled up at forest roads – to the saw mill, where the timber trade process follows. In order to carry out transportation, the resulting costs have to be considered. The contemporary WSC works as follows: timber is produced and piled up in the forest, and subsequently sold to a saw mill by contract. The saw mill organizes the haulage of the timber without considering surrounding conditions - e.g. timber piled up nearby that is ready for haulage. In addition, Austria is dominated by small scale forestry, with only small quantities of timber to be hauled – often less than the capacity of a truck. In order to overcome the shortcomings of the traditional WSC, an optimization process that considers the spatial-temporal dimension is developed. The cooperation of the stakeholders of the WSC can be enhanced, by altering today’s WSC in a significant manner. Timber is not sold to a specific saw mill as it is piled up in the forest (see Figure 1). Forest enterprises can notify the optimization system of a new supply point, as well as saw mills can notify the system of their timber demand. The spatial optimization system allocates the vehicles and plans their routes so that the overall profit (turnover minus haulage costs) of the WSC is optimized. This requires that the timber selling process is done ’on-the-fly’ during the planning process and not beforehand. Additionally, the demands of the saw mills and the forest enterprises have to be fulfilled. 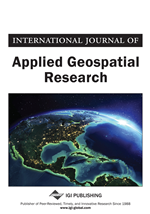 The objective of this paper is to evaluate on the performance of a spatial-temporal amended heuristic to solve the WSC in comparison to an initial solution that behaves similar to a human dispatching manager. The evaluation is based on two test instances and using different Planning Horizons, that are described in the paper. Therefore, a mathematical model is created that is the foundation for the optimization itself, which relies on theory from Geographical Information Science (GISc) and Operations Research (OR).